As I mentioned at the start of this series of Jasco / GE sponsored reviews, the newcomer to the home automation scene is Bluetooth. Here again Jasco / GE has a growing line of products ranging from in wall switches and dimmers to plug in devices like we have already covered. For this mini review we will be looking at the GE 13868 Plug-In Outdoor Smart Switch which has a Bluetooth radio built-in. Unlike the other products covered thus far; this unit is actually designed to be used outside when mounted as directed. It is rated for 120V/60Hz service with a 600W incandescent, ½ HP, or 1800W resistive load and operate in a temperature range of 14-104F (-10-40C). Also unlike the previously reviewed items; this device does not need a hub. What you will need is an IOS device 7.0 or later or Android 4.4 or later to communicate with the outlet via the Avi-on app which is free to download. As mentioned in the previous reviews; this GE 13868 Plug-In Outdoor Smart Switch is packaged in a full color box with but this one has a blue stripe to indicate it is Bluetooth. The front of the box clearly mentions you will need a mobile device and download the free app. On one side it discusses the mesh network and the other tells you what type of devices can be connected like LED, CFL, halogen and incandescent bulbs along with pumps. The back of the box goes over some of the features available through the free Avi-on app like simple on/off control, scheduling including sunrise/sunset, countdown and random modes. Lifting the top of the box you will find a Smart Home Guide and manual sitting on top of the bagged device. Also included is a screw with a wall anchor to hang the device. The device itself is fairly beefy, measuring 5" long by 2 3/8" wide by 1 5/8" thick with a short pigtail to plug into your outlet. 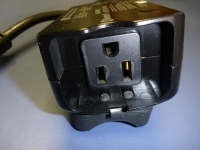 As you can see on the back of the device there is a small hole for you to hang the box from, this is designed to keep the outlet facing down and not collecting water. They also include a rubber boot for the connection to seal this but I am not sure what the practical use is for this. I don't really see people leaving this outside if not in use. But I guess if you do you can cover the outlet.